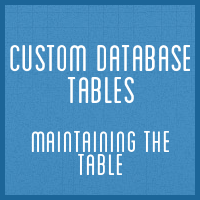 Over the lifetime of your custom table you will probably find that you need to make changes to what it stores, or how it stores it. This may be in response to a need to store more (or less) data. It may be that the initial design of your database wasn’t intended to deal (efficiently) with what your user-base is now demanding. Either way, we need to know how to adapt our table to meet our new needs. This is what we’ll be looking at in this tutorial, and we’ll primarily focused on the function dbDelta() that we first met in part one.